Serious soil salinization, including excessive exchangeable sodium and high pH, significantly decreases land productivity. 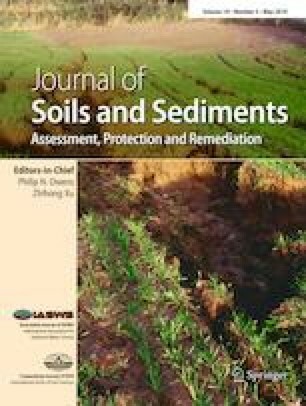 Reducing salinity and preventing alkalization in saline-sodic soils by comprehensive improvement practices are urgently required. The combinations of aluminum sulfate with different types of fertilizer at different rates were applied on rice paddy with saline-sodic soils of the Songnen Plain in Northeast China to improve soil quality and its future utilization. Experiments were carried out in a completely randomized block design. Twelve treatments with aluminum sulfate at the rates of 0, 250, 500, and 750 kg hm−2 with inorganic, bio-organic, and organic-inorganic compound fertilizers were performed. Soil pH, electronic conductivity (EC), cation exchangeable capacity (CEC), exchangeable sodium percentage (ESP), total alkalinity, sodium adsorption ratio (SAR), soil organic carbon (SOC), available nutrients, soluble ions, rice growth, and yield in the saline-sodic soils were measured across all treatments. The relationships among the measured soil attributes were determined using one-way analysis of variance, correlation analysis, and systematic cluster analysis. The pH, EC, ESP, total alkalinity, SAR, Na+, CO32−, and HCO3− in saline-sodic soil were significantly decreased, while CEC, SOC, available nitrogen (AN), available phosphorus (AP), available potassium (AK), K+, and SO42− were significantly increased due to the combined application of aluminum sulfate with fertilizer compared with the fertilizer alone. The most effective treatment in reducing salinity and preventing alkalization was aluminum sulfate at a rate of 500 kg hm−2 with organic-inorganic compound fertilizer. This treatment significantly decreased the soil pH, EC, ESP, total alkalinity, SAR, Na+, and HCO3− by 5.3%, 28.9%, 41.1%, 39.3%, 22.4%, 23.5%, and 35.9%, but increased CEC, SOC, AN, AP, AK, K+, SO42−, rice height, seed setting rate, 1000-grain weight, and yield by 77.5%, 115.5%, 106.3%, 47.1%, 43.3%, 200%, 40%, 6.2%, 43.9%, 20.3%, and 42.2%, respectively, compared with CK treatment in the leaching layer. The combined application by aluminum sulfate at a rate of 500 kg hm−2 with organic-inorganic compound fertilizer is an effective amendment of saline-sodic soils in Songnen Plain, Northeast China. These results are likely related to the leaching of Na+ from the soil leaching layer to the salt accumulation layer and desalination in the surface soil, and the increase of SOC improved the colloidal properties and increased fertilizer retention in soil. In addition, the environmental impact of aluminum sulfate applied to soil needs to be further studied. This research was financially supported by Special Fund for Agro-scientific Research in the Public Interest (200903001-06-6) as well as Heilongjiang Province Science and Technology Program Project (YS15B15).